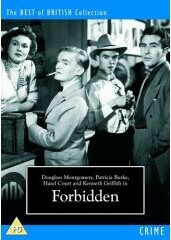 I, probably in common with the vast majority of the UK population, didn’t see the film Forbidden(a.k.a. Scarlet Heaven) when it was shown on television back in 1978. A pity- it’s not been shown since, and managed to disappear from the cinematic radar until this 2007 Odeon Entertainment DVD release. It is part of an exciting new collection (dubbed ‘The Best of British’) from Odeon, who have uncovered obscure home-grown movies from film archives and painstakingly restored them for new generations to enjoy. Each title is ascribed a genre (which features in a colour-coded banner at top and bottom of DVD artwork) and it is surprising as to the sheer range- from Northern Comedy to Gothic Horror! As a complement to the film itself, a very informative booklet comes with each title which enables the film to be contextualised and further enjoyed as a result. Forbidden is notable for being the last film starring Douglass Montgomery (whose c.v. includes such great films as The Cat and the Canary (1939) and The Way To The Stars (1945) before he slipped into television appearances and eventual obscurity until his death. Coincidentally, it was also the last film to be directed by George King (whose first cinematic credit was in 1930, the same year as Montgomery’s first screen appearance) and who died in 1966- bizarrely the same year as Montgomery. Forbidden is resoundingly British throughout, and utilises its Blackpool setting to splendid effect in the same way that Brighton Rock(1947) anchors itself to that seaside town. Generically, Forbidden is a crime thriller with Film Noir elements, and is Hitchcockian in many respects, not least its closing sequence. Made in 1948, Forbidden also resists the temptation to dwell on wartime issues (such as the country’s rebuilding programme) or the knock-on effects of war itself, but actually looks forward to the 1950s in both its style and its content. In short, Forbidden is an extremely well-made curiosity- and just how it has had such a limited exposure remains a mystery. The plot of the film concerns Jim Harding’s ‘sordid little Hell’ which is revealed in flashback after an eye-catching opening which sees the protagonist determinedly making his way through a fairground. The cheery fair music continuing, Harding confronts his lover Jane Thompson in a final effort to make her understand ‘what was behind it all’ which motivates the film noir-esque flashback. As this narrative chain progresses, two firm strands develop- Jim’s friendship with Jane and his wife Diana’s flirtation with Jerry Burn (brilliantly played by character actor Garry Marsh). This maintains the interest, as the situation as it stands is irreconcilable, prompting action on the part of our characters to resolve or alter the situation. That Jim confesses to the adamant Jane ‘I just can’t lose you’ suggests he is losing his rational self-control, and this is echoed in a memorable montage sequence of subjective realism, the voices from the past returning to haunt him as the images of the fairground swirl about his senses. His resulting actions dominate the remainder of the film, and fill it with several moments of effective suspense and well-handled tension. If Hitchcock had not gone to Hollywood in 1940 at David O. Selznick’s pressing financial request, he might well have made a film such as Forbidden. It really is that good. ‘Forbidden’ (a.k.a. ‘Scarlet Heaven’) is available on DVD from Odeon Entertainment.